I spotted this book a while back and have never forgotten its superb blend of crisp rhymes and powerful theme. Add this to your holiday shopping list as the perfect read-together book for little ones learning to embrace their own spots or not-so-spots. Ward, Helen. Spots in a Box. Somerville, MA: Templar Books, 2015. Print. 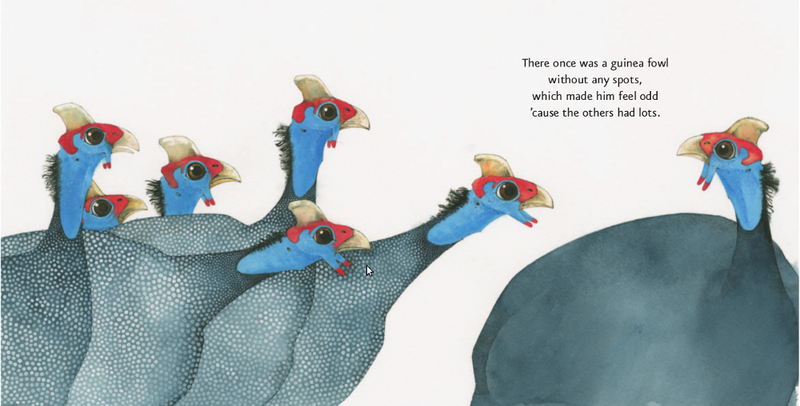 Summary: What’s to be done when you’re the only guinea fowl without any spots? Well you write a letter and order some! Critique: The rhyme schemes throughout this story are “spot on.” No, really, I’m not just waxing punnetic. War never overreaches or forces the meter with flimflam syntax or nonsensical words. (Just to be clear, syntactical gymnastics and mishmash words are allowed in creative writing, however, only a few authors have succeeded in deploying these tactics with any real skill. Seuss…Dahl…Twain…etc.) Instead, Ward keeps her language tuned up and the story drives itself! And throughout all the guinea fowl fun had with clots, blots, inky-font dots, and i-topping spots, readers of any age imbibe a subtly conveyed powerful message about how self-expression can be the root of self-fulfillment when it is not designed to merely meet public expectation. Ferry, Beth. Stick and Stone. Illus. Tom Lichtenheld. Boston: Houghton Mifflin Harcourt, 2015. Print. Summary: A stick and a stone become fast friends after an unfortunate name-calling incident. Critique: This story puts a clever twist on the old saying: Sticks and stones may break my bones, but names will never hurt me. It stars the iconic stick and stone who form a solid friendship when stick defends stone from a mean, name-calling pine cone. Unfortunately, despite this excellent set-up, the bulk of the story does not document how to withstand bullying, criticism, or name calling. It catalogs all the fun two friends can have swinging, sitting on the beach, or playing games. The plot takes a turn towards the random when a hurricane blows Stick into a boggy puddle. Stone rescues Stick — a clear reversal of how Stick first saved Stone from name-calling. The heroics are worth a cheer, but I couldn’t help wondering whether the themes would have been better served if Stone had been put in a position to rescue himself from another bully. Or, what if Stick had stand up for himself? It’s one thing to stand up for others, but standing up for yourself is a skill many of fail to master even in adulthood. The result feels like a missed opportunity to grapple with huge facets of childhood and healthy development. Nonetheless, Ferry tells this story with surprising frugality. The text is compact, succinct, and easy to read aloud. There are times when the need to make the rhyme work throws consistency out the window — verb tenses shift from past to present, or formerly complete sentences break into fragments. Luckily, Lichtenheld’s illustrations are richly consistent! Working in pencil, watercolor, and colored pencil on Mi-Teites paper, the artist delivers a textured world that readers want to touch. He equips Stick and Stone with endearing facial expressions and highly emotive physical gestures — no easy task when anthropomorphising twigs and rocks. On paper, the characters come alive. They break no bones, but they will warm your heart!